Dalal Street is known for its traditional and conservative ways of investing. 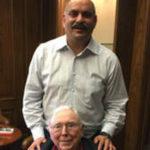 Since infancy, we have been tutored to follow the hallowed principles laid down by Warren Buffett, Charlie Munger and other eminent Gurus that one should invest only in high-quality companies with impeccable levels of corporate governance. 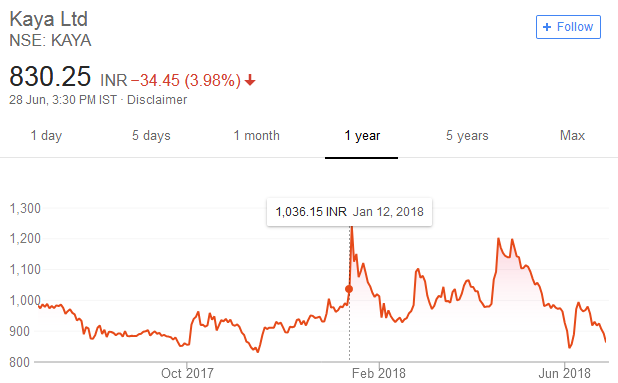 However, in 2015, Porinju Veliyath stormed into Dalal Street and offered novices a radical piece of advice – that they should abandon blue-chip stocks and instead invest in stocks of ‘chor’ companies. Porinju’s advice was so revolutionary and shook the foundations of investing that everyone was forced to look at it. He spoke in a very persuasive tone. “It is a known fact that around 75 per cent of promoters of domestic-listed companies are not very ethical and honest. They do not take care of the minority shareholders’ interest. 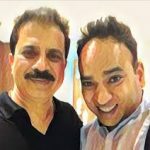 To convince the doubting Thomases, Porinju produced data about several so-called ‘bad’ and ‘penny’ stocks which had gone on to give mega multibagger gains. Last year, when I bought Fin Cable @ 30, KRBL @ 20, Orient Cem @ 30, Granules @ 110, HSIL @ 80, SRF @ 150, they were bad guys!! Recently when I was buying Shreyas Shipping @20, Force @425, Zicom @ 105, 8K Miles @110, many of you warned me about management quality! When I accumulated 8% stake in Geojit personally at a mktcap of Rs.3 Cr, most of my well-wishers were uncomfortable! As a natural corollary to his advice that investors should buy so-called ‘bad’/ ‘penny’ stocks, Porinju made it clear that he did / does not have a high opinion of Gurus who advocate investing in so-called ‘moat’ stocks. He referred to them as “biggies, big people, fancied guys” and said the “moat had become a trap”. 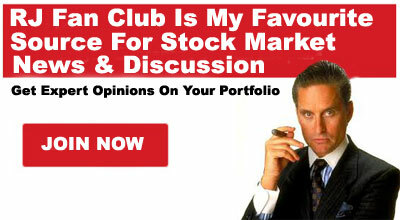 “I hated these stocks in the last one year because there are no values left, they are great companies. That is again I am repeating, I have been always talking look at the stocks, the great stocks and not the great companies. I am telling you one more thing. In the last one year, Samvat 2071, what happened? The moat became a trap for all the new investors in this country. A lot of people I know, thousands of them, they started first time investing in this last one year. They listened to the biggies and the big people, fancied guys and they were all talking about some stocks which have gone up by five times and 10 times and 20 times and now, it has become moat stocks. This was the biggest trap and people are losing 20-40 percent by doing that kind of safe investment,” he said. Porinju’s reference to past data met with skepticism amongst investors. However, the turning point came when it was seen that the stocks referred to by Porinju did blossom into magnificent multibaggers while the so-called ‘moat’ stocks languished. In fact, Porinju holds the World record for the most profitable tweet ever. He recommended a buy of five stocks which he described as “penny stocks” but not “penny businesses”. Even of the five stocks went on to give mind-boggling gains, with one of them, KRBL, giving an unbelievable gain of 2500% (25-bagger). Later, Porinju referred to his tweet as the “Billion Dollar ‘penny stocks’ idea”. He also recommended stocks like KNR Construction and Mirza International, which had dubious reputations, but which went on to deliver massive 10-bagger gains. In the wake of the spectacular success of Porinju from buying so-called ‘bad’ companies, novices indiscriminately loaded up on junkyard stocks like PC Jeweller, Vakrangee, Gitanjali Gems, Punjab National Bank, Reliance Communications, Bhushan Steel, HCC, HDIL and Jaypee Infratech among others in the hope that these would also blossom into megabaggers. According to a report by ET, Vakrangee and PC Jeweller added nearly 37,500 retail investors each in the March 2018 quarter. 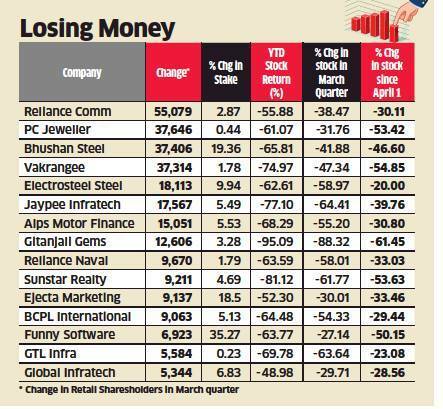 The ET has documented the incalculable losses that novices suffered from these stocks. “Investors should eliminate speculative activities by proper way of research and analysis and buy fundamental strong stocks,” G Chokkalingam, the veteran stock picker, advised the novices after the event. Porinju advocated the caution that because one is buying untested stocks without a proven track record, the exposure to the stock must be limited so that risk is under control. “We usually have 10-12 stocks in a portfolio. Because as the AUM has been rising, we have widened our portfolio to 40-45 stocks,” he told Ayesha Faridi. However, at some stage Porinju decided to go to the other extreme and take concentrated positions. This is evidenced by the positions that Porinju has taken in LEEL Electricals, Kaya and Va Tech Wabag. In LEEL Electricals, Porinju’s EQ India Fund PMS holds a staggering quantity of 33,03,473 shares as of 31st March 2018, comprising 8.19% of the equity capital. The investment has not fared well with the stock having lost 50% on a YoY basis. In Kaya, Porinju has gone even further with a holding of 19,55,904 lakh shares comprising 15.01% of the equity capital. Kaya is down about 14% on a YoY basis. Other stocks where Porinju’s EQ Fund PMS has substantial holding includes Va Tech Wabag and GVK Power. Moneycontrol accessed a letter dated 16th May 2018 addressed by Porinju to the clients of his PMS where he sated that he is “baffled” at the “extent of erosion of portfolio value in such a short period”. He pointed out there is an “unusual selloff in mid- and small-caps is going on, leading to the irrational pricing of many of our portfolio stocks”. However, Porinju assured that the stocks in the portfolio had “value” even if their “prices” did not reflect it. 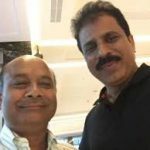 Porinju did not dispute the letter though he claimed that the stocks referred to in the press report were proprietary, and not PMS, holdings. Surprised to see Media confusing my proprietary holdings in Micro-Caps with PMS. Weighted Average MarketCap of EQ PMS is Rs. 5437 Cr as on today! Stocks under PMS are held in client-names – more than 5% disclosed to Exchanges. He also drew attention to the stocks like Biocon, D-Mart, Reliance, Jubilant, Future Consumer etc recommended by him which have delivered magnificent returns. “I don’t enjoy discussing the many under-performers,” he said with a chuckle. Now, in the light of the further savage correction in the bourses, Porinju has ruefully conceded that his “big bet” on “improving corporate governance in a structurally changing Indian economy” has “backfired”. However, Porinju was careful to qualify his statement “as of now” implying that things may change for the better in the near future. He also stated that he is “still optimistic about Changing India” and that it is “too early to write it off”. Porinju also admitted that he had underestimated the craftiness of the chor promoters and their ability to find loopholes. However, he also reminded investors that they have no option but to invest in stocks because there is no other asset class with the same potential. Change is not an option but the imperative for India. If you are not optimistic about #ChangingIndia then, which domestic asset-class you are betting on? He also assured that small-cap stocks will continue to be the option where enormous wealth can still be generated. “92% of India’s $2.1 Trillion equity wealth was created through small-cap investing,” he pointed out. It cannot be denied that small-cap stocks, including many recommended by Porinju, have indeed generated hefty gains for us. However, instead of actively seeking “chor” companies to invest in, it is better if we focus our attention on high-quality small and mid-cap companies with impeccable credentials and confine our investments only in those stocks. This way, we can avoid the perils of the “chor” companies whilst raking in mega multibagger gains! It was really painful to listen advice to invest in Chor companies at a time when these chor companies were making Big hole in PSU Banking system. Really those investors deserves no mercy from market who acted on such advice . I had time and again warned against such advice in this forum . Stock market is not Casino. It is only Quality which will prevail. You may find very few examples when people made money in third grade stocks but can find millions of small investors who lost money in such companies every boom. Better to invest in blue chip large cap stocks catering to 1.3 billion consumers, which includes PVT BANKING AND FINANCIALS, CONSUMER CENTRIC COMPANIES. I agree with the views of Kharb. Making a bold statement like “invest in chor companies” was itself very bad in taste, professionally as well as ethically also. How can you invest in proclaimed chor companies and then eulogise it. The fundamental premise itself was wrong. 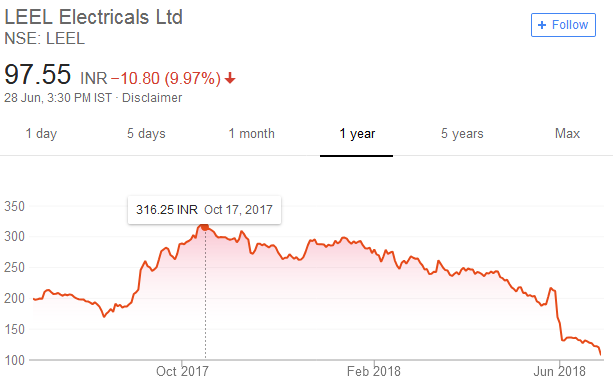 And that’s why when the market falls, these kind of companies loose almost 90% and the small investor who purchases in the hype and hoopla created by many pundits including the likes of Porinju, finally suffers and never recover their money. One who ends holding the pillow when the music stops suffers heaviest. I agree .. When stock falls by 50% everyone starts badmouthing the person recommended it and when it goes up 10 times they think it is because of their own analysis and wisdom. I can understand PMS investors who share profit with Porinju feeling being cheated. However others who are taking free advise have to own up responsibility of investing. Last 5 years no one was complaining about chor companies giving returns at 45% CAGR. Now if it has corrected by 505 it’s not a big deal.. The price is being intentionally dragged down for an open offer at a lower price. The free fall in LEEL is being allowed as is no share swap ration working out for the merger. However the HVAC market looks solid for the future and the company should deliver good results. What is your views on ‘Bang Overseas’. Is it a potential multibagger penny stock? All investing strategies fail someday, there are no perfect investing strategies that work every time. Fact is market is irrational and risky and while investing we have to keep in mind risk is not going anywhere. Its common for people to dance when profits appear big and cry when something appears to go wrong. When are people going to learn blaming others ain’t going to solve any problems, you have to take responsibility for your own losses. Market is not our servant to keep delivering us profit day in and day out, start taking responsibility for your decisions and always do your own research.